Recently I was listening to National Public Radio as they reviewed the book Stalking Irish Madness with the author Patrick Tracey. In this book Tracey searches for the roots of schizophrenia that has haunted his family for what appears to have been five generations. Most recently two of his sisters have suffered from an onset. It is said in our family that we are bound to have one of two issues: 1) a rare blood disease like antiphospholipid antibody syndrome which I acquired, or sarcoidosis which attacked my oldest brother or 2) mental illness which most often shows up as manic depression or schizophrenia. 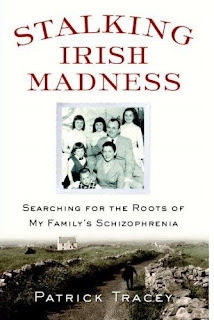 This is not to say that our family mental issues are a result of our Irish ancestry. It may even be coincidental that so many have suffered from it. But, it would be nice to find the root cause of mental illness, especially when it seems to disrupt full family units for generations. Perhaps that is why I love medical genealogy. It just might help the scientist get a closer view of family medical issues and look at both social and genetic patterns.